Britain's impending departure from the European Union is not just about trade for Ireland but is an existential issue for its nearest neighbour. Northern Ireland will become Britain’s only land frontier with the EU. The consequences remain a thorny issue in talks between Brussels and London and a threat to peace in the British province. Euronews' Shona Murray sat down with Irish Prime Minister Leo Varadkar to find out how Brexit could affect the country. Shona Murray: So it's been a very busy week in Davos. And of course, Brexit is dominating. And I'm joined by the Irish Prime Minister Leo Varadkar. Prime Minister thanks for joining us. The backstop itself is a means to an end and the backstop is there to give the people of Ireland north and south a legally binding and legally operable and workable guarantee that, no matter what happens as a consequence of Brexit, a hard border won't emerge again on our island. And the difficulty of course with a time limit is effectively it's exactly that. It says a hard border won't emerge on your island for three years or five years or six years or 10 years but after that, it might. And that's where the difficulty arises and I often hear people particularly people who support Brexit in the United Kingdom saying that they don't want the hard border but they also don't want the backstop. But what are they offering in return? All they're offering in return for the backstop, if we were to give it up, is a promise to sort it out somehow over the next two years or the promise of some sort of technology that doesn't yet exist. 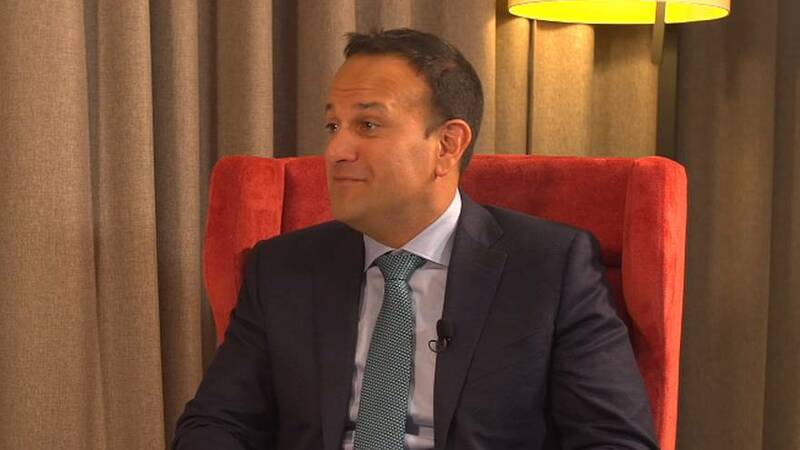 Leo Varadkar: I believe they are honest in their intent but as has been the case with Brexit really from day one, I'm not sure it's been fully thought through. The only way in my view in my opinion that you can avoid a hard border in the longer term is to have a very close if not full alignment on customs and on market regulations. And that is a direct conflict with the view that the United Kingdom can go it alone entirely on these issues. Leo Varadkar: Well it's very evidenced that there are lots of different opinions in the United Kingdom. The country seems to me to be still divided almost 50/50 on whether they should leave or remain. It's entirely their decision of course, not one that I ever wanted to interfere in. All we can do is defend our interests, our peace process, and the interests of our citizens north and south and our economy our farmers and exporters and that's what we're going to do. We should never forget that Brexit is a problem that was created by Britain. I think it's a real act of self-harm. That's their choice but it's also creating problems that they're imposing on people who didn't vote for Brexit including the majority of people in Northern Ireland and people who weren't asked who are affected by it such as people in the Republic of Ireland. Shona Murray: And you've said before that it's within the gift of the UK Parliament or at least the UK government to take no deal off the table because we know how harmful that is. Is it irresponsible of Theresa May having been called to do so that she hasn't? Leo Varadkar: I understand. At least I think I understand what she's doing in that regard. It’s that if she takes no deal off the table now, that then takes the pressure off parliament to come to a decision as to what they want and form a workable majority. But I do think that if we approach that point towards the end of March, surely it's in the interests of all our citizens in the UK and Ireland and in Europe, that we don't have a hard Brexit with no deal. And that is avoidable, that is avoidable by extending Article 50. Shona Murray: If the backstop is the greatest stumbling block and it leads to a no deal scenario then Ireland will have to put up a border its responsibility to do so under the single market. The Customs Union would have to protect those areas. So what's your solution then. Leo Varadkar: I think it's important to say that from my point of view anyway a withdrawal agreement, a deal that doesn't give us that legal guarantee that there won't be a hard border between Northern Ireland and Ireland… that's a deal in name only. And it's not something that I can live with that I could recommend to parliament or accept at European Council level. If we do end up in a no-deal-scenario that does present an enormous dilemma for all of us. The UK would have obligations as well, to abide by World Trade Organization rules. They wouldn't be in a position to do trade deals with anyone really until they start abiding by the WTO rules. And both the UK and Ireland have commitments under the Good Friday Agreement and the peace process which, in many ways, as I said at the start, override economic and trading objectives. So I think we’d have to sit down, the UK, Ireland and the EU. It couldn't be a bilateral arrangement. This involves EU competencies and we would have to negotiate a deal which resulted in full alignment of customs and regulations and guess what we already have that on the table! So why don’t we ratify the deal that we have rather than going through a chaotic period after a no-deal only to end up with an agreement very similar to what we have now. Shona Murray: Nonetheless, the European Commission spokesperson this week confirmed that it would be the case there'll be some checks on the border. And we've heard from Michel Barnier and others. So is that something that the Irish government would absolutely resist even if it came under pressure from other member states like France and others who want to make sure the single market is protected? Would you be prepared to have very difficult conversations with the 26 member states? So we'll have to sort these issues out anyway I think. And they can be sorted out in the next couple weeks. Leo Varadkar: I'm concerned about dissident republican violence in Northern Ireland. There was a car bomb in Derry a couple of days ago. Very lucky that nobody died. I don’t want to say that that was directly linked to Brexit or that it was directly linked to the hundredth anniversary, after all, of the Irish Parliament being founded. But Brexit is now all part of the context. It's one of the reasons why the power-sharing executive the power-sharing government isn't functioning in Northern Ireland. And it is something that's causing great concern for citizens in the north and also along the border counties. Things that they thought had been settled have now been unsettled and that does create an environment an environment that dissidents can exploit. And I don't think we should allow them to do that.